Thank you chair and all the members of this important Committee on the Rights of Persons with Disabilities for letting me speak on behalf of International Disability Alliance (IDA). My name is Nagase Osamu from Inclusion Japan, a national member of Inclusion International, which is a member of IDA. 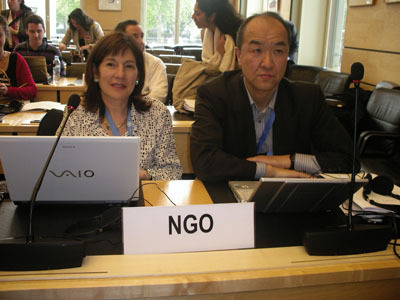 I would like to say a few words about the big earthquake which hit the north-eastern part of Japan on 11 March and its implications to CRPD. In fact today marks exactly one month after this major disaster and many people are observing moments of prayer today. More than 27,000 people, mostly Japanese but people from different countries as well, have been found dead or missing. As someone from Japan, I would like to take this opportunity to express my sincere appreciation to all the kind thoughts and support provided to us from all parts of the world. Also personally I would like to apologize for the environmental damage caused by the radioactive leaks from nuclear power stations. Last week I was in Miyagi, next to Fukushima, serving as a volunteer for the support center for persons with disabilities, established by Japan Disability Forum, which is a national network of disability organizations in Japan, and includes many members of IDA. Our organizations are doing our best. In Miyagi, I could not believe my eyes when I visited the coastal areas hit by tsunami. The devastation is just beyond imagination and expression. But I was struck by the determination of persons with disabilities, their family members, supporters and the public in general, to meet this challenge. There was one mother. When there was another big earthquake 30 years ago, the public nursery was closed for days and her daughter with intellectual disabilities, still small, had to stay at home for a long time. The mother, who provides day services now, is determined to keep her center open for those who need it. She resumed services on the following day of 12 March when there was no electricity or gas. Her center even provided food to the family members and community. There was one blind man, a retired coal miner, in his late 80’s. When at home, he was on his own, with the map and geography of the neighborhood in his head. But his still new house was destroyed by tsunami. He had to evacuate to the school and now stays in its gymnasium. His mental map is no more useful and he needs much more support from his family members, including his grandchildren. He does his best not to take much water so that he does not have to go to the restroom often. Reasonable accommodation, community support services, and accessibility, they are all lacking. These are just a few examples. There are so many episodes of courage as well as alienation, cases of inclusion, exclusion and discrimination. They show both the strength and weakness of our community. The disaster has made the existing inclusion and exclusion many times more obvious. The disaster has reminded us the importance of the putting CRPD into practice, the important responsibility of States Parties and this Committee. Not only article 11 on situations of risk and humanitarian emergency, article 9 on accessibility, article 19 on living independently and being included in the community, and article 32 on international cooperation, to name a few, but the entire CRPD has to be put into practice. We are reminded of this in a very painful way. We humbly hope that lessons we are learning can contribute to the work of this Committee. In closing, once again, those of us in Japan would like to thank all the expressions of solidarity as well as support from the international community and look forward to meeting the challenge of implementing CRPD with our friends and colleagues around the world.